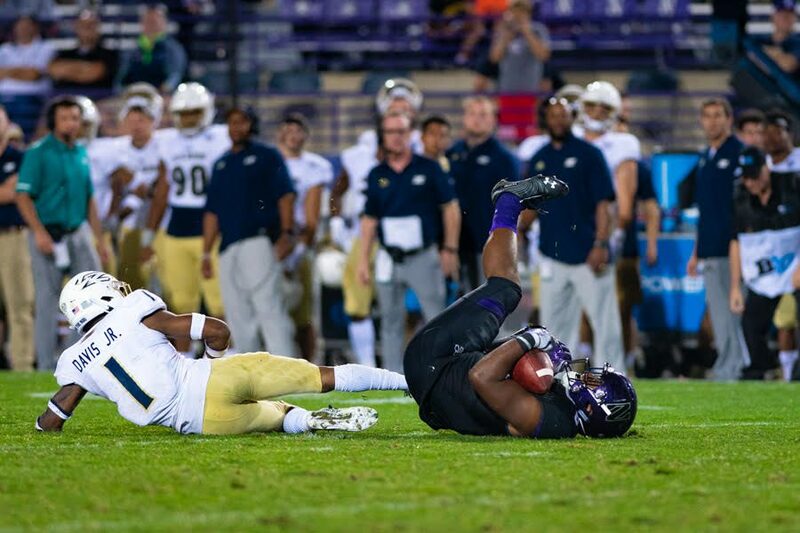 A Northwestern player lies on the ground. The Wildcats were overrun in the second half by Akron en route to a 39-34 defeat on Saturday. The metaphorical curtains pulled across Ryan Field at halftime — intermission, if you will — of a predictable but pleasant musical, one with a few missed notes but plenty of Wildcat smiles and enough feel-good moments to justify the price of admission. Those curtains pulled back 20 minutes later and unveiled a scene that quickly devolved into a rough dress rehearsal. Northwestern defensive backs missed coverages as if on trapezes; the star of the show, senior quarterback Clayton Thorson, made numerous crucial errors; everything went completely off-script. The end result for the Cats (1-2, 1-0 Big Ten) was a 39-34 loss to Akron (2-0), an unassuming minor-conference team that hadn’t beaten a Big Ten foe since 1894 — a defeat made especially catastrophic by blowing a 21-3 lead entering the second half. Three turnovers by the offense, all returned for touchdowns, and five passing plays of 20 or more yards allowed by the defense proved to be the eight nails needed to seal NU’s coffin. Those disastrous errors overwrote what was, on the whole, a superior performance by the Cats, who outgained the visiting Zips by over 100 yards in offense, another 105 yards of penalties and by a two-to-one margin in first downs. NU became the 17th team over the past 19 seasons to give up two pick-sixes as well as a fumble return touchdown in a single game and worsened those teams’ record to 0-17. Thorson committed all three, all in the second half, and put the blame on himself. It wasn’t, however, entirely a fair assessment. The secondary repeatedly conceded big plays to pinpoint Akron quarterback Kato Nelson and the offensive line struggled against a front seven far weaker than what it’ll see in Big Ten competition. Fitzgerald harped especially on the former of the two issues afterwards. Although Nelson finished the game with a pretty stat line — 277 passing yards and two touchdowns, many on perfectly weighted and placed throws — he was given plenty of space to look downfield by NU’s defensive backs. Cornerbacks Greg Newsome and Trae Williams both particularly struggled. Coming out of halftime, Akron rode two long drives and its first pick-six to cut the deficit to 21-19, but the Cats seemed to get back on script when Thorson found junior superback Cam Green in the end zone to push the advantage back to two scores. Then that script went up in flames. The Zips ripped off three consecutive scores to take full control of the orchestra, then nearly choked the lead themselves with conservative defense and risky time management in the final minutes. Yet after a Thorson heave as time expired hit the ground, the visiting sideline and a tiny contingent of visiting fans erupted. It was NU’s biggest blown lead in a loss since 2011. Sophomore running back Jeremy Larkin tallied 134 total yards but, given little space to operate, averaged a meager 3.7 yards per rush. Senior safety Jared McGee led the defense with eight tackles, including three for loss. Green had a career day in the receiving game, recording 11 catches for 125 yards and two touchdowns. Even if Green was nominated for Best Supporting Actor, though, the rest of his musical would be a strong candidate for biggest disappointment. Most of an announced crowd of 40,014 had departed by the time the metaphorical curtain went up for the second and final, merciful time.